A universal theme of life that transcends age, gender and hierarchy is the need to experience success. From the owner of an enterprise, the directors, managers, clerks, and workers; ladies, gents, children and every human has a destination in mind that he or she defines as success. The picture one has of experiencing the successful event actuates the individual to be active. The driving force behind a person's efforts is the need to experience success. A related word is vision - this word refers to the end point that a person or organization intends to achieve. A clear and proper vision helps provide a direction to one's efforts. A vision is not a day-dream! The vision is rooted in reality and based on knowledge. If a "vision" stems from assumptions - is not based on facts and figures, then the vision becomes inaccurate. So the point is that the vision has to be workable not hypothetical. In contemporary India there are many visionaries who have elucidated their vision in the form of books. It is very evident that their visions are products of deep knowledge, wisdom, imagination and analysis. A) Dr. Abdul Kalam Azad: our Ex President of India is a deep thinker on matters related to development of India. His vision is that by 2020, India can become a developed country. A book dedicated to this concept is India 2020: A Vision for the New Millennium. There is also a website dedicated to this vision (click here). B) Nandan Nilekani: he is a remarkable business leader who gave up his job as the CEO and MD of Infosys to join the Union Govt. of India, as the Chairman of the Unique Identification Authority of India (UIDAI). His very famous book is Imagining India: The Idea of a Renewed Nation. Both these books relate to the words vision and success. The above highly successful and accomplished individuals have compressed their wisdom, knowledge, imagination and analysis to produce their books that verily are vision documents. The surmise is that knowledge in its various forms like practical knowledge (wisdom) and theoretical knowledge when combined with imagination produce a vision. This is shown in the graphic at the start of the blogpost. When an empowering vision actuates an individual, he starts following up with activities. The Indian revolutionaries like Mahatma Gandhi and Subhash Chandra Bose both shared a vision of an independent India, but had different value systems. 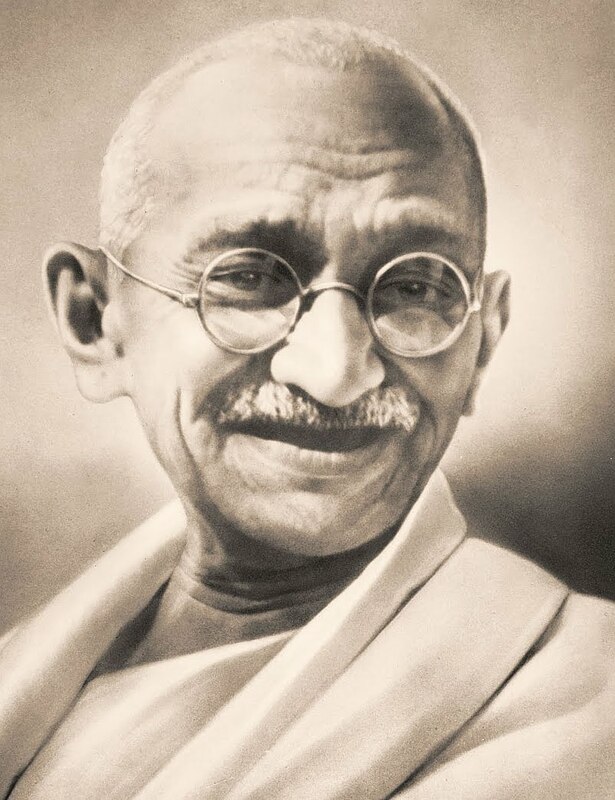 Gandhi took to ahimsa (nonviolence) and satyagraha (non co-operation) as the means of achieving the vision of an independent India. Bose is the aggressive one who founded the INA (Indian National Army) and set to work for his vision through armed struggle. Nevertheless, the vision is what is most important for activities. Modern day organizations, hence, work keenly on developing a common vision and sharing it with organizational members to ensure that activities are done in concert - to produce an organizational outcome that provides strength and success for the organization. Creating and Sharing a vision is Tricky: This requires knowledge and the presentation of the vision has to be rooted in facts and figures, for the vision to be believed as achievable. Or else, the vision will be seen as a pipe dream and the organization will remain rudderless. The shared vision influences the language, ideas, and metaphors of an organization. A vision does not lie in a vision statement, the organizational vision is reflected in the every day language, ideas, and working of the organizational members. Once this phenomenon is observed in an organization, the vision of the organization is really at work. And this is happening at many organizations. Knowledge is the state of knowing. There are many types of knowledge - it may come from books, or by studying markets, experiencing various events in the marketplace etc. Knowledge is also encountered through serendipity. Nevertheless, the type of knowledge leads to different types of visions. Knowledge is the parent of vision. The basic marketing fact is that marketing success is based on HABIT CREATION and pleasure experiences. Marketers strengthen habits in the market that create pleasure in customers. Corex - the no. 1 product of Indian pharma market owes its success to codeine phosphate that suppresses cough and creates calmness or pleasure. Despite various antismoking regulations and advertisements tobacco smoking or consumption continues to thrive, because HABITS once established are difficult to break. Another simple fact is that sugar and salt in combination are very tasteful and help create habits in customers. Habits are very vital for marketing success. Pleasure experiences promote the 'habit mind'. And this part of the mind is not fully guided by the 'logic mind'. Marketing is hence, based on the 'emotional mind' of the customer. It is not without reason that marketers emphasize - buying or purchasing or prescribing decisions are very much an emotional decision making process. People do business with people. Lux - the beauty bar of filmstars - thrives on advertising where divas like Aishwarya Rai and Katrina Kaif stimulate viewers and create an emotional bond between the brand Lux and prospects. The marketing communication activity of Lux too attempts to create pleasure in the mind of viewers. This strengthens the habit behind Lux sales. We see Aishwarya Rai with her hubby Abhishek Bacchan in the ad for Lux above. So the point is that vision is a product of knowledge. The type of knowledge influences vision creation. And when there is a cumulative impact of various types of knowledge it produces a comprehensive vision which can see the light of the day. Knowledge creates vision, which leads to activities. The performance of activities in turn creates experiences that add to the knowledge bank - and this redefines or sharpens or fine tunes the vision. It is an ongoing process. Thanks for reading this blogpost, which I hope will influence your cycle of knowledge-vision-activities for the better. Please scroll down, click on older posts to read other blogposts. Do recommend this blog to your acquaintances!